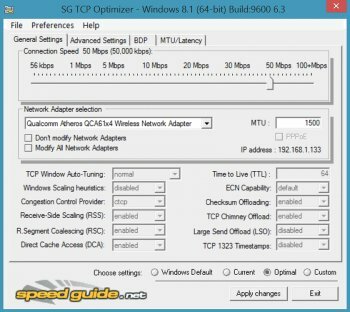 TCP Optimizer is a free, easy Windows program that provides an intuitive interface for tuning and optimizing your Internet connection. There is no installation required, just download and run. Am using this on Windows 10, and works well! Noticeable speed difference when surfing in general. For those who really wish to get their hands dirty, program allows you to tweak certain registry settings to your hearts desire. FINALLY! Proper Win8.x+ support. Been waiting on this for a few years now. Any IT tech worth their mettle has this in their toolbox. Works splendidly and squeezes *every* last ounce of performance from both the OS/TCP stack and network connection. Nice to see a Win7 update. Pros: These network tweaking programs for the most part are SNAKE OIL. You can see this when doing a speed test like Speakeasy. The networking reset tools are good though, those help when certain Malware, etc. corrupts the TCP/IP stack. Bottom Line: Does little or nothing. Pros: Works well with Windows 10. Bottom Line: Am using this on Windows 10, and works well! Noticeable speed difference when surfing in general. For those who really wish to get their hands dirty, program allows you to tweak certain registry settings to your hearts desire.